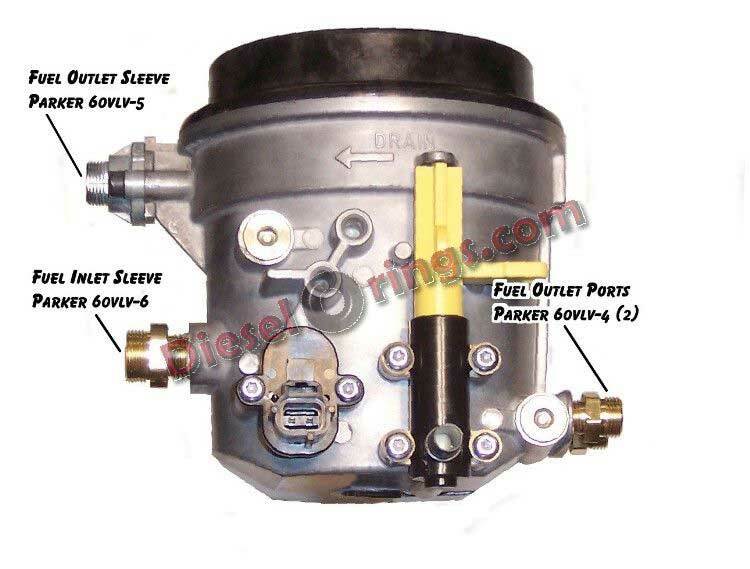 Parker 60VLV-4 Viton sleeves 7.3L engine fuel rail connections and fuel bowl. These 1/4" fuel sleeve seals fit the steel fuel injection lines that connect the fuel lines to the cylinder fuel rails. One seal is required at each fuel rail fitting so 1 package of 2 seals is all that is requied for the engine. On the 99-03 7.3's, the fuel rail fitting on the passenger's side is a common place to find a fuel leak and will run down the rear of the block and drip on the starter motor. With the 94.5 to 97 engines, both fuel rail connections are at the rear of the cylinder heads and can be problematic. Model Year 94-03 7.3L diesel. Order of 1 is a set of 2 sleeves. Location of 1/4" sleeves on the 99-03 fuel bowls. The 94.5-97 models only have these sleeves at the engine fuel rails.